Lincoln Park RFC, founded in 1968 by Dan Fohrman, Jerry Fohrman and Tom Williamson is one of the oldest clubs in the Midwest. 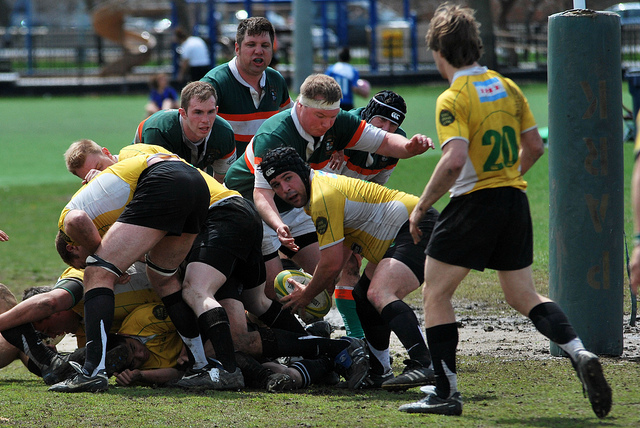 A charter member of CARFU (Chicago Area Rugby Football Union), Lincoln Park currently plays at the Division II level. To find out more about the origins of Lincoln Park RFC, read what founder Dan Fohrman had to say about the club’s early history. The Lincoln Park Rugby Club is a non-profit organization dedicated to the development of Rugby in Chicago – and the United States, through sportsmanship and camaraderie. Throughout its history, the club has supported the game by playing and promoting it throughout Chicago and the Midwestern region, as well as on foreign soil. The club has made tours to Mexico, Brazil, Ireland, Wales, the Czech Republic, Argentina and Spain. On its visit to the West Indies, LPRFC became the first U.S. rugby club to be official guests of the St. Lucia Rugby Football Union. Lincoln Park has gained many friends and colleagues from these travels and returned the favor by hosting many foreign teams and showing them the true nature of Chicago hospitality. Guests have included: the Old Edwardian’s (Johannesburg, South Africa) ARAWAK RFC (Bahamas) the Mexican National under-23 team, and our good friends from Wrexham, Wales; a team so fond of Chicago they returned for a second visit. While playing ambassador for the sport and our city, LPRFC also has maintained a winning history. The club reached the National Division II Men’s Championship in 1994 and in 2010 won the DII Midwest Championship. In addition to promoting the competitive aspects of the sport, the club never has lost sight of the social aspects that make the game so enduring, as well as a commitment to furthering the sport. Lincoln Park has volunteered time from its players to assist with Park District events, and many of its hundreds of players and alumnus are active in various charitable organizations for myriad causes around the city. Some of our more recent endeavours include the head shaving event for St Baldricks Children’s Cancer fundraiser, Movember initiative for cancer charities and an upcoming toy drive for the Lurie Children’s Hospital. LPRFC has also played an active role in developing the sport at the collegiate level, several times hosting a tournament for the local Chicago area Universities. We hope these programs to be enjoyable for the players, helpful in their pursuit of rugby and other amateur athletics, and a boon for the sport as it draws more players with greater skill. Our practice and home fields are located centrally to the Lincoln Park neighbourhood of Chicago. We are within easy access to Lincoln Park, Lakeview, Wrigleyville and the Gold Coast. Local bus services run close by and there are several ‘El’ stations within a few blocks. The season here is split in two with Midwest divisional games making up the bulk of the Fall season (September – November), then playoff games and friendlies comprising the Spring season (March-May). Training for each of these seasons usually begins a month before the start. We typically practice twice a week (Tuesday & Thursday) with occasional weekend sessions during the pre-season. LPRFC welcomes anyone to become part of the club either as a new player or a supporter. Previous rugby experience is not necessary, though a level of athletic ability and desire is required. Rugby is a demanding sport on the body. Our current practice location is located on the far north side of Chicago at Pottowanamie Park, close to the Howard red line El station. This is a full-size practice field with lights. We occasionally use other fields depending on the weather and conditions. Home games are played at Diversey Harbour. The game pitch is located between the Diversey driving range and Lake Shore Drive. After the match, the teams and supporters can be found at Hidden Shamrock (2723 N. Halsted). It is through the efforts and support of our sponsors and friends that we are able to keep the club on a secure financial footing, but with ever-rising costs, any help is much appreciated. If you would like to show your own support of the club, perhaps you are a former player or someone who watches our games then please use the secure PayPal donation link.